There was a time when driving a 4x4 was almost an anti-social offence. But now 4x4s no longer get the bad press they used to and thankfully the awful term 'Chelsea tractors' doesn't appear in the tabloid press with the frequency it once did. People have started to accept that having a four-wheel drive doesn't necessarily mean you're driving some high polluting, fuel hungry, large SUV. Much of that is down to the work done by manufacturers to improve efficiency in SUVs. You only have to look at the likes of the BMW X1 for proof. The xDrive 18d model is capable of averaging almost 50mpg (according to the claimed figures) with CO2 emissions of 150g/km - the kind of economy that a few years ago you'd have only associated with a diesel saloon. The last few winters have had a big impact too with the ice and snow making the advantages of four-wheel drive plain for all to see. But opting for a 4x4 doesn't necessarily mean having to buy a big off-roader. Audi has offered quattro four-wheel drive in the majority of its saloons and Avants for many years and all Subaru models (with the excpetion of the short-lived Justy) have symmetrical all-wheel drive as standard. And with the birth of the 'crossover', the benefits of four-wheel drive are becoming more affordable. 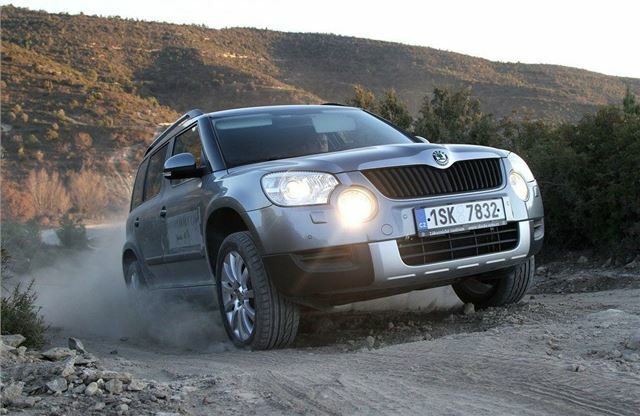 The Skoda Yeti is a prime example. Launched in 2009 it has proved a real hit for Skoda and is consistently the most popular review on www.honestjohn.co.uk. 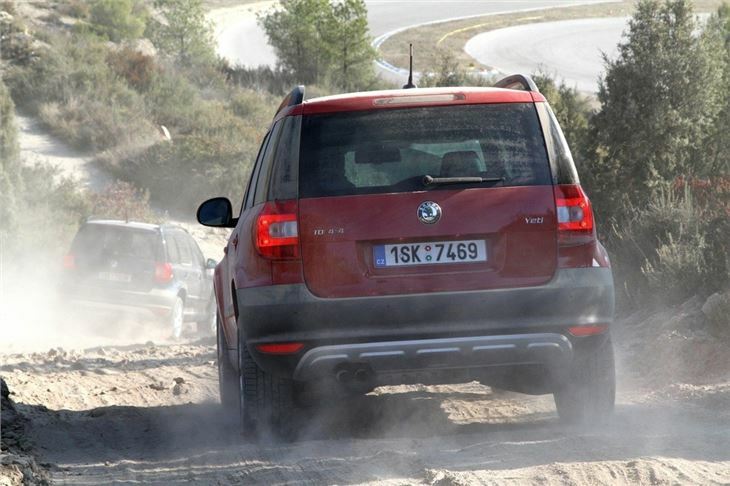 Like most crossovers, it's available with 2WD and 4WD, but the popularity of the four-wheel drive models has surprised even Skoda. 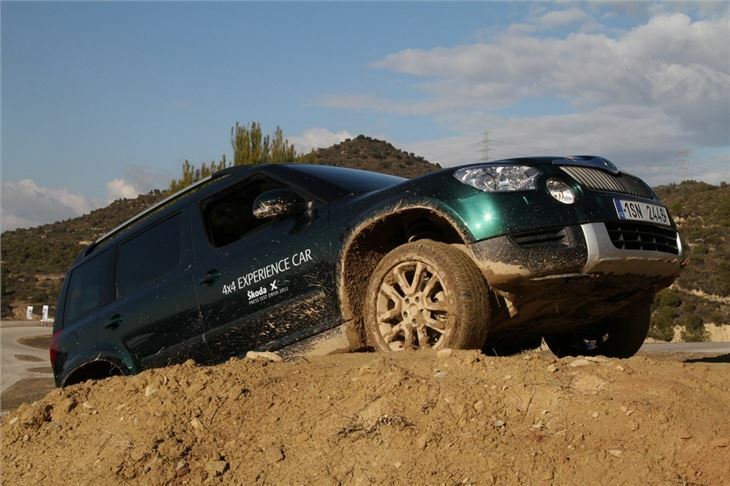 What's equally surprising is just how able the Yeti is when it comes to rough terrain as we found out on a specially organised off-road course. It may be a trendy crossover but the funky Skoda is certainly not all show and no go. In fact it has enough off-road ability to put many larger off-roaders to shame. Gravel tracks and rocky lanes pose few problems for the Yeti thanks to its clever latest generation Haldex clutch. 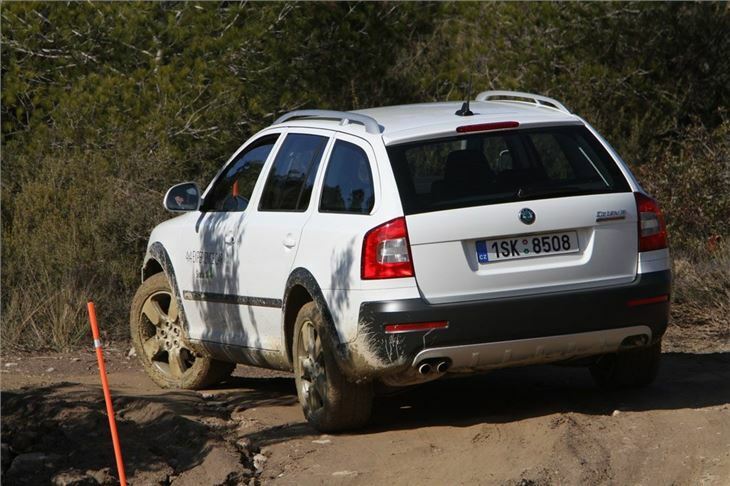 The more you push the Yeti and the more extreme the terrain becomes, the more the Skoda surprises you with its effortless ability to take it all in its stride. Steep inclines covered in mud and loose stones pose no problems, nor do heavily rutted tracks. And while you're tackling this, from behind the wheel the Yeti is a serene place to be. It's all very civilised. There are no complicated switches or controls either. Just a simple button on the dash that's marked 'off-road'. Press it and it switches all assistance systems to a special off-road setting, so the accelerator responds more sensitively when pulling away on loose surfaces, while the Auto Hold feature helps the vehicle out in tricky situations, stopping it rolling back on inclines. But the most useful system is the Hill Descent Control. This uses the brakes to maintain a constant speed descending down steep slopes, regardless of whether the vehicle is in any of the gears from one to three, reverse, or neutral. In fact, it continues to work even if you stall. You can set your speed with the accelerator and it will maintain that continually down the slope, even if the angle of the hill changes on the way down. Not all Yeti engines are available with 4x4 drive. The smaller units are focussed on economy, so you have to go for the 1.8 TSI (which is great fun to drive but thirsty with it) or the popular 2.0 TDI which comes in three choices of either 110bhp, 140bhp or a top of the range (and quite pricey) 170bhp. The mid-level 140bhp is most people's choice and it's easy to see why. It's quiet enough, refined and pulls very strongly in gear, while claimed average economy of 47.1mpg is another big attraction. 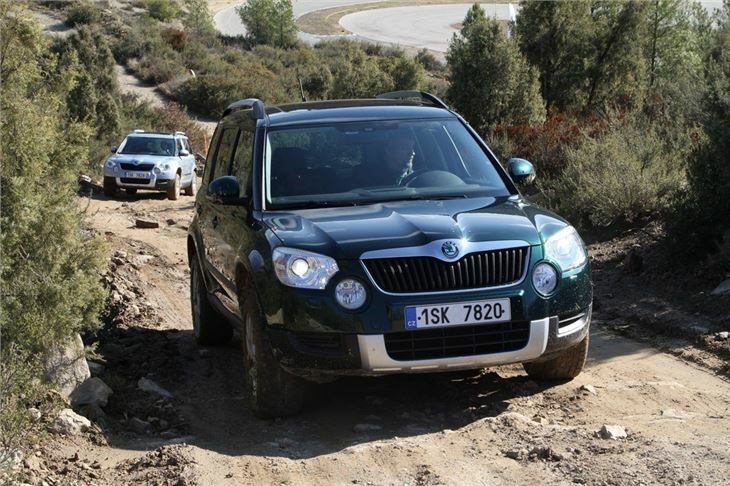 The Yeti isn't the only Skoda model that's available with 4WD. There's the impressive Octavia Scout (below) - a beefed up version of the Octavia Estate with extra ground clearance (180mm if you're counting and the same as the Yeti). It doesn't come with the off-road button of the Yeti or the Hill Descent Control, but it does have the same Haldex clutch and is similarly impressive on rough terrain. In fact its ability is even more of a surprise given that it doesn't look that different from a standard Octavia and it rides amazingly smoothly over rough terrain, better than the Yeti in fact. Of course, very few owners of 4x4s ever actually venture off-road in anger (a grass verge on a country lane doesn't count) but there are plenty of advantages of having four-wheel drive on road too. Skoda offers both the Octavia Estate plus the Superb and Superb Estate as 4x4 versions and the 2.0 TDI 140bhp models are now also available with Skoda's DSG automatic gearbox. So if you don't need the rugged look or extra ground clearance, but want the extra ability of a 4x4, these are ideal. They look identical to the standard models (see the picture below) and aren't just for towing caravans or horseboxes either. In terms of handing the four-wheel drive makes a considerable difference. As well as the obvious advantages of extra traction, for instance when pulling out of a junction in the wet or when driving over compacted snow, four-wheel drive has benefits for handling too. On a specially constructed low friction circuit, we were able to to compare driving a 4x4 Superb with an identically engined 2WD drive version. Not only does the 4x4 feel much more composed, but you don't need as much steering input in corners and it puts down its power much more smoothly, without the front wheels scrabbling for grip. But the biggest difference is the speed. 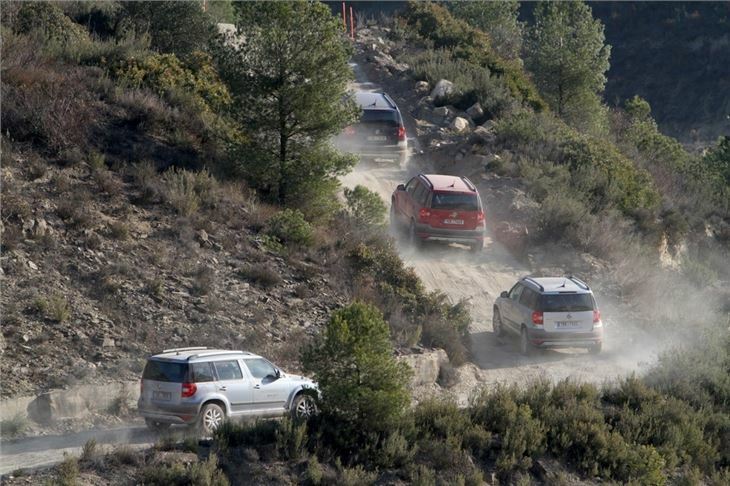 The 4x4 Superb is considerably quicker round the course and gives you more confidence in bends. In terms of cost, opting for a 4x4 Superb carries around a £1500 premium and there is an obvious impact on fuel economy and CO2 emissions, although it's not huge as the Haldex clutch only sends drive to the rear wheels when it's needed. So, for example on a Superb 2.0 TDI 140bhp manual, choosing the 4x4 model means a only 4mpg less and an increase in CO2 emissions from 149g/km to 163gkm (moving it from VED Band F to G and making it £30 a year more to tax).